The new Silver Lake Library Center designed by M2A Architects presents a very nice, yet not groundbreaking, design at a great price, which is exactly the point. 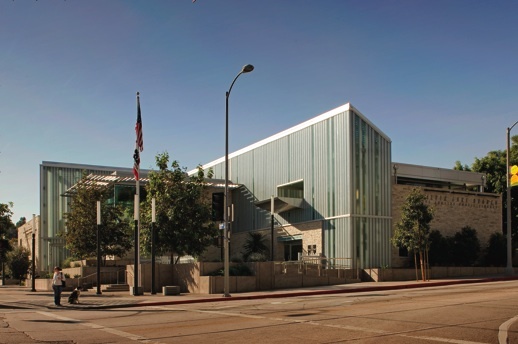 The Los Angeles Library Bond Construction Plan is an LA success story. In part, that’s just because it’s not the usual mess-up. Launched through a $178.3 million bond measure passed in 1998, the plan has brought about 36 solid, sometimes even artful buildings from talented architects like Hodgetts & Fung, Stephen Ehrlich, and Barton Phelps. And somehow the program has remained on budget and on time—practically a modern-day miracle. This side entrance exhibits the fine materials used by m2a. There is lots of thoughtful detailing, such as the clear channel glass and photo voltaic roof, both of which cast interesting shadows in the space in addition to serving a functional purpose. The last of these projects is emblematic. M2A Architect’s Silver Lake Library on the corner of Glendale and Silver Lake boulevards was, like its brethren in the program, not completed on a huge budget ($12 million) or at a huge scale (13,600 square feet). But it delivers on serious architectural impact nonetheless. And it has given the neighborhood an unmistakable, but not over-the-top, symbol to be proud of, encouraging more people to explore an impressive library collection while prompting the city to be more ambitious in its architecture. To approach the split-level library, which sits on a raised base above a ground level parking structure, one progresses through a concrete-floored courtyard designed by landscape architect Mia Lehrer. It’s inviting, with flora on the periphery, benches shaped like stacks of books, and charming artwork by Silver Lake local Christina Ulke. The only jarring part is an awkward security gate. Of course, compared to some of the Berlin Wall-sized gates the city puts up around its public buildings, this is a picket fence. The L-shaped building’s facade is both subtle and intricate, with a textured combination of vertical panels of clear and channel glass and patterned limestone (the stone was meant to keep the very rectilinear building from feeling too institutional). The architects have chosen strategic moments to wow, most importantly the 35-foot-tall corner window that reveals the main reading room. It invites people inside, giving them a clear view of the library’s inner workings. We took every chance we could to connect the inside with the outside,, said M2A principal Barry Milofsky. The library’s connectivity and its embrace of the neighborhood is a direct nod to former Silver Lake resident Richard Neutra and his indoor/outdoor aesthetic. In fact, the library sits next to one of the Neutra’s office buildings and just down the street from several of his most famous houses on the Silver Lake Reservoir. Inside the cavernous entrance hall, one feels an immediate sense of lightness, brought about by 30-foot-plus ceiling heights, ubiquitous windows and skylights, and a constant connection to the outside that makes everything seem even larger. The outside is indeed brought inside here with dark stone tile floors picking up on the exterior, and glass gardens made of colorful shards that mimic flowing water near the corners. The useful if unspectacular multi-purpose room across from the entrance hall, lit from above by clerestories, serves such functions as accommodating lectures, seminars, and community meetings. 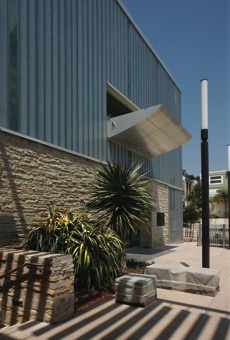 The main event, atop the narrow, light-infused stairway, is the giant reading room, which feels perched over Glendale Boulevard thanks to its street-front siting and massive corner window. The rest of the library interior is not exactly edgy, but it feels comfortable and uncluttered. Its unified plan subtly separates various uses—the library stacks, a children’s room, teen area, multi-media centerr—through varied ceiling heights, small canopies, and furniture configurations. The library also stands as a model for sustainability. 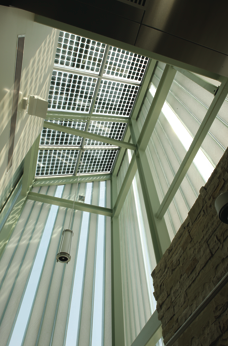 The building is seeking a LEED Gold rating, and includes 168 solar panels on the roof, low-flow plumbing, renewable woods, recycled and local construction materials, substantial day lighting and automatic light sensors, and more. The building isn’t an icon that will redefine Los Angeles, but that’s the point. It’s solid architecture that impresses but also fits well into its setting. A sleek, artful, and entirely contemporary building couldn’t be more at home than in a creative place like Silver Lake. With buildings such as these, the city will become what it was always supposed to be: a collection of distinct neighborhoods that together make up a dynamic whole.